“I’m learning a lot about God from my kids.” I think every Jesus-following parent says it at least once. It is true. Jesus said, “Truly, I say to you, unless you turn and become like children, you will never enter the kingdom of heaven. Whoever humbles himself like this child is the greatest in the kingdom of heaven” (Matthew 18: 3-4). This morning when darkness still loomed over the house, I rose to my oldest daughter already awake. She had set her alarm for 5 AM so as to not miss the much anticipated lunar eclipse. It was supposed to be first visible at 5:25 AM, but in an effort to not miss any of it, she was awake nearly a half hour early. The rest of the family wasn’t that interested in the phenomenon, so she planned her rising all on her own. She could hardly sleep last night, so it was not a surprise to me that she was already awake when my alarm went off at 6. The time she chose to wake up did not startle me. What did shock me was the place she chose to watch. She pulled a chair and pillow from the living room over to the front door. She made herself comfortable and sat, marveling at the moon through the glass insets. Any reasonable adult would say that chair was an annoyance and was placed in a dangerous spot, in the line of doorway traffic. But it was the perfect venue to focus on something almost magical, something that my mature brain can’t wrap my mind around. 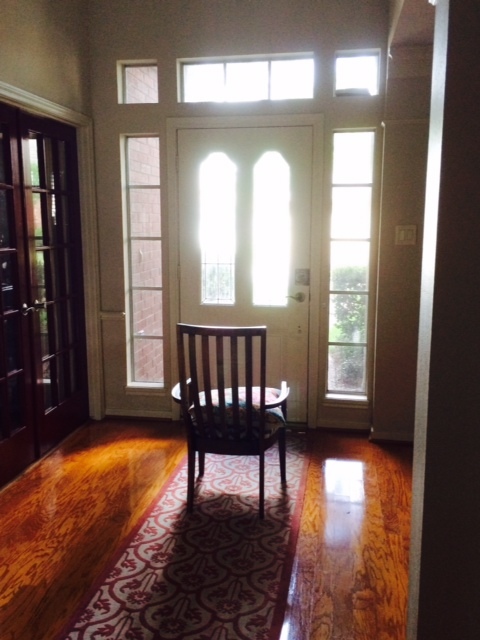 The sun, which we can’t see at night-time is yet right behind us–behind her in that chair. Its strong rays of sunlight reflecting over our heads on the surface of the moon millions of miles away. The earth, on which we stand, on which she sat in that chair, mysteriously floating in the space in between. The orbits of the moon and the earth in such synchronization and alinement that before her very eyes, the shadow of earth, orb on which she sat in that chair, appeared before her over the face of the moon–it’s light slowly burning red. What an amazing event that is so much grander and substantial than a walkway ridden with chair. As we went on with our day and I returned home from morning errands, I saw the chair unmoved from the wee hours of dawn. 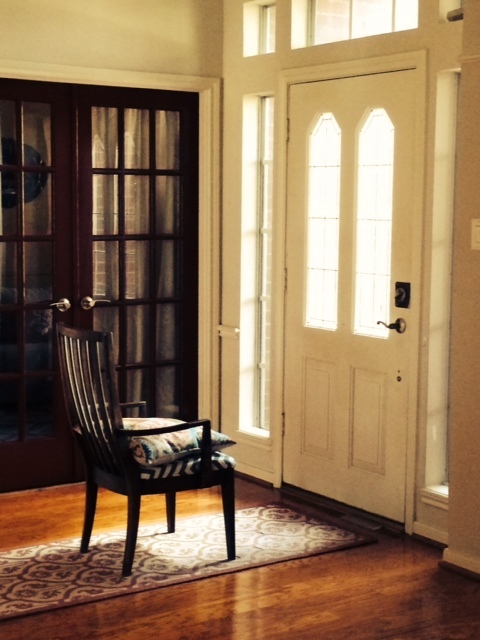 The sunlight, now cascading through the windows bore such sweet light on that seat, on that place of tiny miracle. My daughter has taught me something today. I have learned, and have been told over and over again, that I need to sit and marvel at God. Others may be annoyed with me. Others may think I am in the way. My resolve to sit and take in Jesus as I see Him throughout the day may irritate those who think it odd and silly. Some might deep down feel the sting of resentment that I have gone to such measures to encounter God. But I long to be like the carefree and uninhibited children. I no longer want to be an adult with to-do lists, logical answers, and cynicism. Jesus, teach me, like you taught the disciples, to humble myself, turn, and become like the child. I have for far too long walked with the shadow of reason and logic hiding my heart from the everyday glory of Jesus. How can I follow His Spirit, if I shield my eyes from seeing Him? How can I soak in His words and ponder His parables if I block my ears from hearing Him? How can I sense His presence and act on His urgings if I cover-up my feelings with puffed up arrogance and pride? I, and most “Christians”, have been walking around in a “total eclipse of the heart” religion. We have covered ourselves with our performance and success, rather than being “hidden in Christ” (Col. 3:3), reflecting His glory, not our own. Last night, my eleven-year-old delighted in asking questions of astronomy and selenology, of the heavens and their movement, just in anticipation for what she hoped to see. She didn’t presume to have all the answers. Her eyes doubled in fascination with the size and wonder of it all, even before witnessing. Are we adults even asking questions anymore? Do we think we have it all figured out? The mysteries of Jesus are beyond any human mind. His wisdom and knowledge deep. We will never exhaust all that He has for us. How boring and mundane to be the one who has forgotten this simple truth! What a dull and joyless, responsibility-driven, task-filled adult life! We need not live this way. He wants us to have life to the fullest, to marvel at His love and His Spirit, to wait in eager anticipation for just a glimpse of Him. The chair will remain in it’s new home today. I want to be reminded to seek out all of the wonder and joy Jesus has for me. Even amidst my daily work, I will pass by and catch a glimpse of the Spirit’s reminder to me. He loves me so well to know that I need reminders and nudges. He understands my failing heart and fleeting zeal because undoubtedly, I will trip over it at some point. Thank you, Jesus, for telling me again. Angie, how beautiful! How touching……..live in the moment and carry it with you for all the tomorrows! Next PostNext Registration Opening Soon!